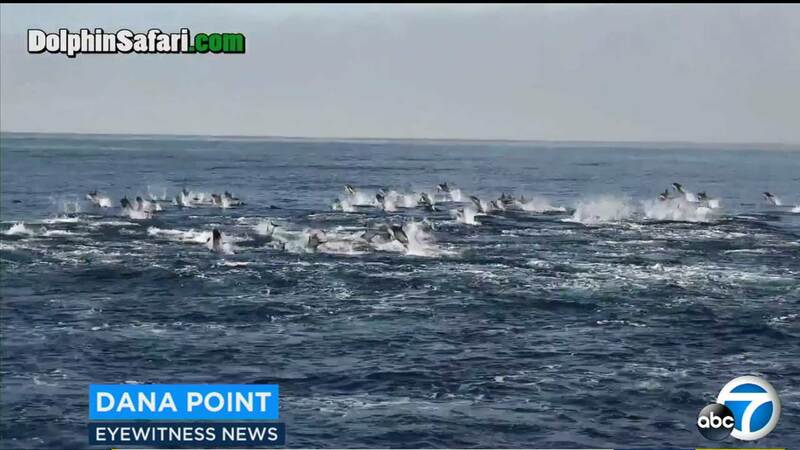 DANA POINT, Calif. -- A tour boat of whale watchers were treated to a rare sight off the Dana Point coast on Thursday, as hundreds of dolphins were spotted porpoising at high speed in the ocean. Porpoising - in which marine mammals jump repeatedly above the surface as they swim rapidly - helps dolphins swim faster because of the lower resistance in air than water. The behavior can happen at any time and without any apparent cause. The dolphin stampede was captured on video by Captain Dave's Dolphin and Whale Safari. The tour company says Southern California has a greater density of dolphins per square mile than any other location worldwide.